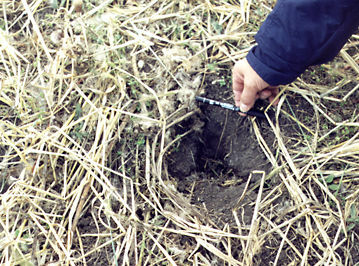 In the exact center of the north circle there is a three-way crack in the soil. This crack is less than one inch wide. It is now filled with loose, finely crumbled soil. The firmly packed clay loam appears to be cut away in three flat planes, sloping downward about 30 degrees from top surface. Each plane would be close to an equilateral triangle, 6 inches (15 cm) to a side. We were not the first ones to notice this oddity. When the farmer's wife came to the field to meet us she said, "Did you see the hole? Our family thinks it's very strange." While brushing away thistledown to photograph the hole, I pulled on a piece of straw. To my amazement I pulled up a stalk and head of barley that had fallen into (or been sucked into?) the hole, top-down. It had become buried to a depth of at least 12 inches (30 cm). Loose soil had fallen back into the hole, burying the head. This is the actual head of barley pulled out of the hole. The maturity and freshness indicate that it is the same age as the laid plants in the formation. Barley beards fan out. Anyone who has handled barley knows that the beards have serrated edges. Tiny barbs catch when you rub from the ends towards seeds. A head of barley would not easily fall, beards first, into a small crack in the ground. The ruler shows a width of about 1 1/2 inches (4 cm). That crack in the earth must have been at least two inches wide to a depth of 12 inches when the head fell in.